Special Men's Travel Kit $2.25 Each. Special Women's Travel Kit $2.25 Each. 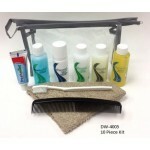 10 Piece Women's Hygiene Travel Kit.6 oz. Toothpaste2 oz. Shampoo Body Bath2 oz. Hair Conditioner2 o..
Travel & Hospital Hygiene Kit $3.75 Each. Wholesale Hygiene Kit with10 ItemsIncludes:1- .85 oz. Toothpaste1- 2 oz. Mouthwash1- 1.5 oz. Roll-on..